On my way across the Great Basin from Colorado to California, I had found myself camped for the night near 8,000ft at the end of Baker Creek Rd in Great Basin National Park in Nevada. I was here to escape the oppressive summertime heat below in the desert that would have made it difficult to sleep at lower elevations, as well as to tackle a few summits the next morning. This was my second visit to the park, the first time to go after the obvious highpoints of Wheeler, Jeff Davis and Baker. Today I wanted to visit the 11,926-foot Pyramid Peak, the next highest peak in the park which also lands on a few Nevada peak lists. The few other summits on either side would serve for bonus material. Having just entered the Pacific Time Zone, I found myself on its eastern edge where sunrise would come very early, before 6a. Consequently, I was up around 5a and starting off on the Baker Lake Trail shortly after 5:30a when it was plenty light out. I followed the trail through forest for some five miles over the course of the first two hours. Around the second mile I passed a trail junction for the South Fork not shown on the topo maps (but later I found it on the NPS map). The trail is in great shape as most NPS trails are apt to be, including some rustic boardwalking in the wetter fens found in places. I didn't quite reach the lake, stopping about a quarter mile shy of it (never did see the lake all day) when I realized I wanted to head south towards my summits, not actually to the lake. The trail leading to the pass SW of Pyramid Peak is not well-used and hard to follow, though some ducks can be found to suggest you're on the right track. Southwest of Pyramid Peak are two unofficially named summits. 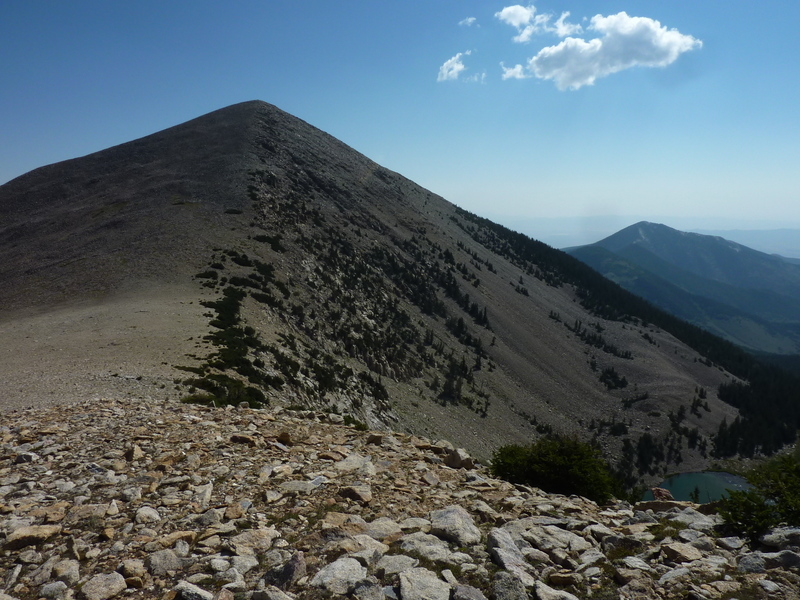 Johnson Peak is the nearer one, only 3ft shorter than its southwest neighbor, Quartzite Peak. Quartzite has almost 500ft of prominence, but the drop between them isn't much, giving Johnson the weaker claim to "peak" with only 150ft of prominence. Rather than make for the low saddle that the trail goes over between Pyramid and Johnson, I headed more directly up Johnson's North Ridge. After following the ridge for some distance, I began contouring across the talus-strewn West Slope thinking it might be faster than going over the summit (which I planned to tag on the way back). I don't think I saved any time, but I did run across an old mining site near the Johnson/Quartzite saddle, with a deep horizontal shaft and a collection of broken colored glass found outside. An old foot trail leads back up to the ridge. It doesn't appear much of substance ever came out of the hole other than rock. It was 8:45a before I reached the summit where one is treated to views up and down the range, with Wheeler and Jeff Davis rising high to the north and future summits of Washington and Lincoln to the south. I found no register here, nor on any of the other summits I visited. I spent the next hour hiking the ridgeline to the northeast, back over Johnson and then onto the talus/boulder summit of Pyramid, the highest I would reach today. Almost another mile further to the northeast lies unofficially named False Pyramid with a 400ft drop to a saddle enroute. The continuing traverse between them would consume another 45min, the cross-country over False Pyramid being easier than its higher neighbor. Thick clouds were gathering overhead, beginning to block out the sun and threatening some precipitation which as far as I could tell was the only weather for 50mi in all directions. Luckily none would fall before I was off the mountain. The fastest route back at this point would have been to descend the steep slopes to the north in order to return to the Baker Lake Trail, or possibly to the east to reach the South Fork Trail. Instead, I decided to explore the continuing ridgeline down to the northeast, another 1.5mi of cross-country and more than an hour's effort. The talus gave way to forest which devolved into a downed tree-for-all before I finally found my way back to the Baker Lake Trail. This left me with less than 2mi of trail work and by 12:15p I was back to the van at the TH, an outing of less than 7hrs.